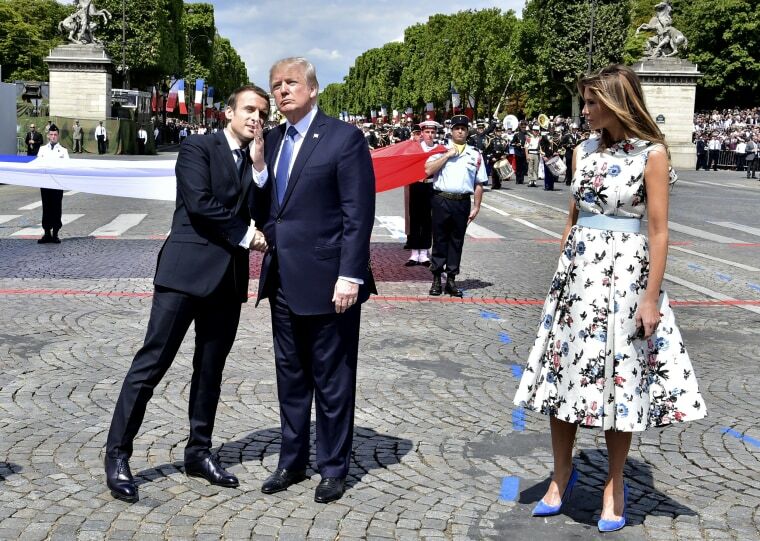 Donald Trump and Emmanuel Macron watched as American and French troops marched side by side in the Bastille Day Parade. 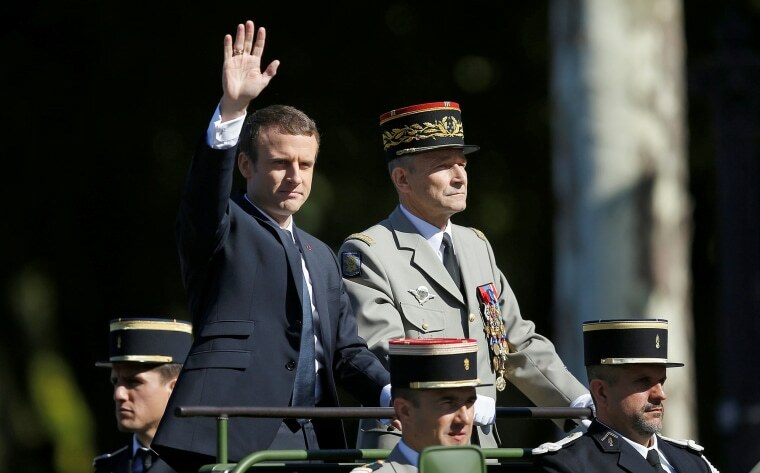 French President Emmanuel Macron and French Army Gen. Pierre de Villiers arrive in a command car for the traditional Bastille Day parade on the Champs-Elysees in Paris on July 14, 2017. 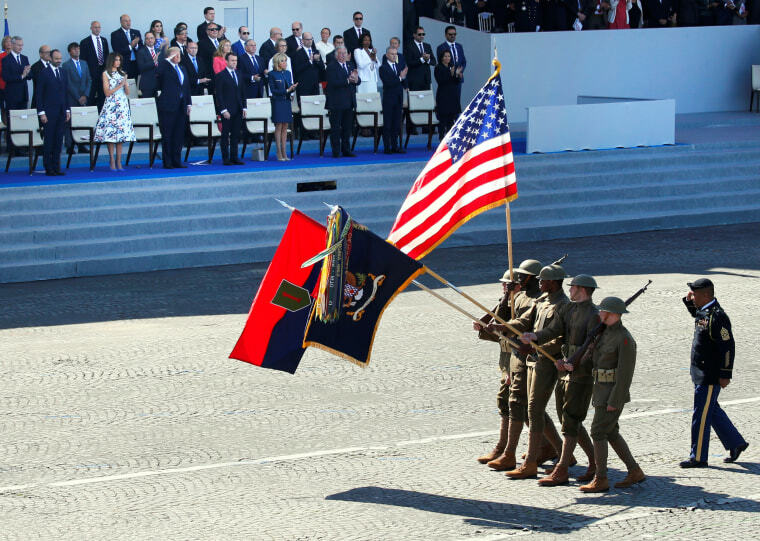 U.S. soldiers wearing World War I helmets march past Macron, his wife Brigitte Macron, President Donald Trump and first lady Melania Trump. 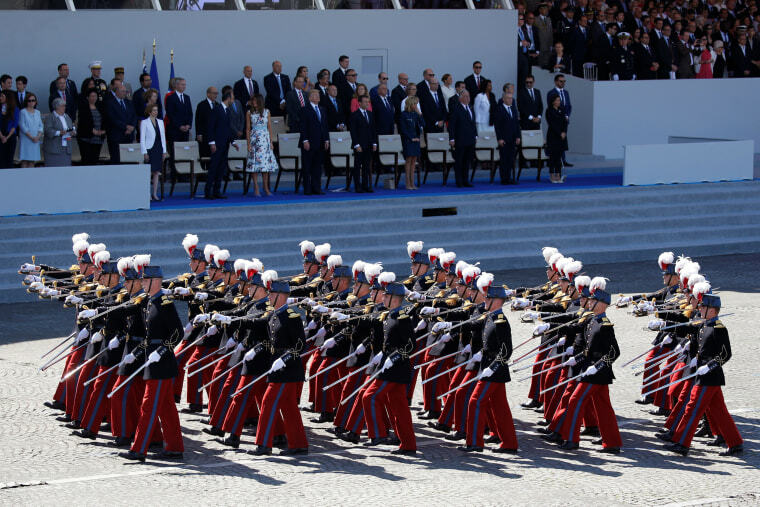 This year's Bastille Day parade has dual symbolism: Not only does it celebrate July 14, France's most important holiday, marking the storming of the Bastille prison in 1789, which helped spark the French Revolution. 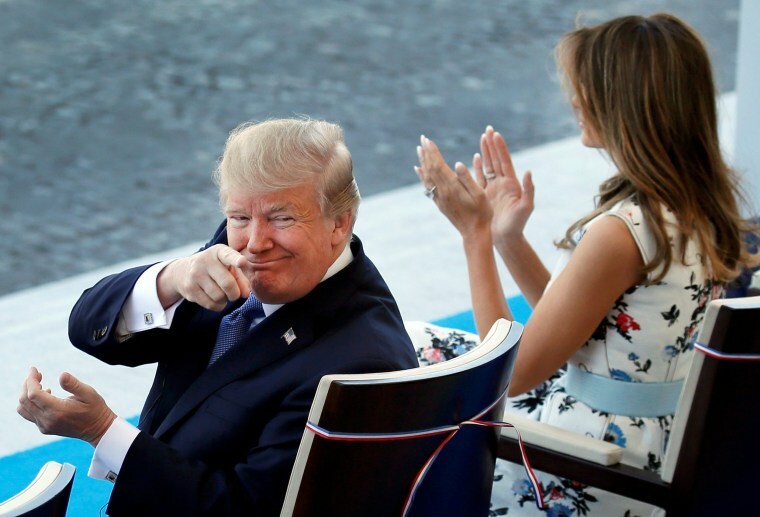 It also commemorates the 100th anniversary of the United States' entry into World War I.
Trump and the first lady applaud during the parade. 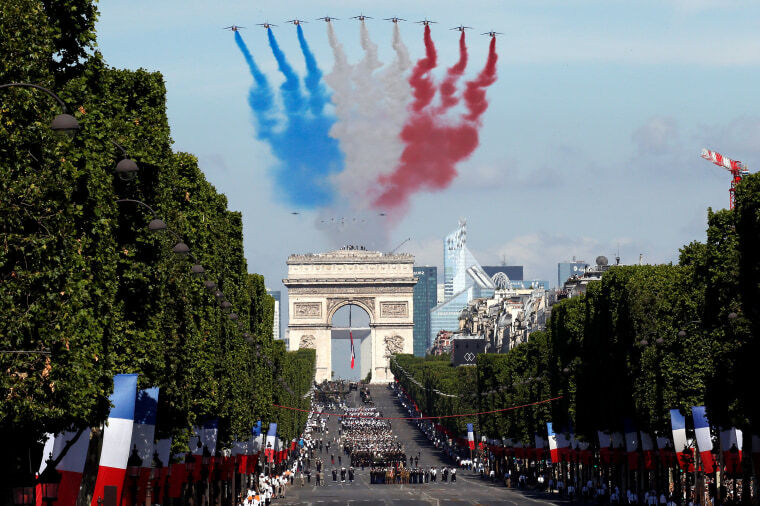 Alpha jets from the French Air Force fly over the Champs-Elysees. 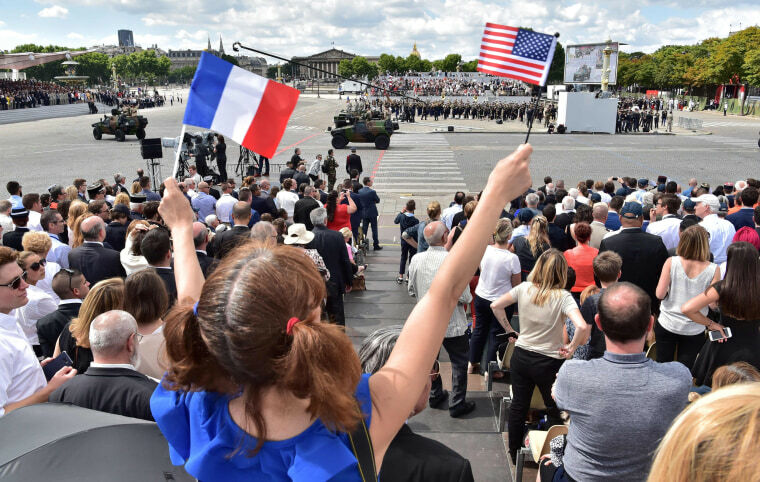 A girl waves the French and U.S. flags during the parade. 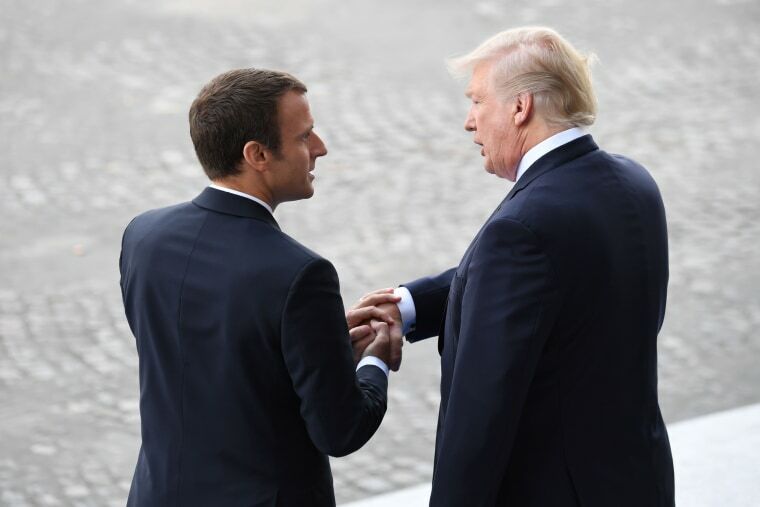 Trump attended the event as Macron’s guest of honor. 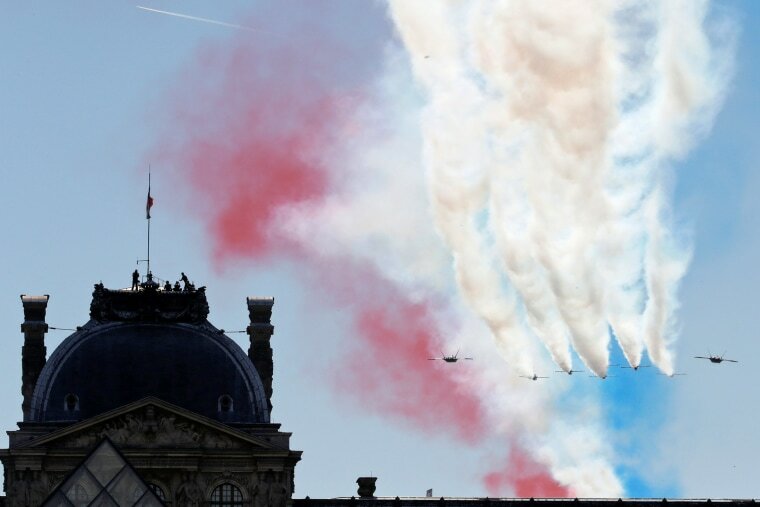 French Air Force jets fly over the Louvre museum. Cadets from the military school of Saint-Cyr march on the Place de la Concorde. 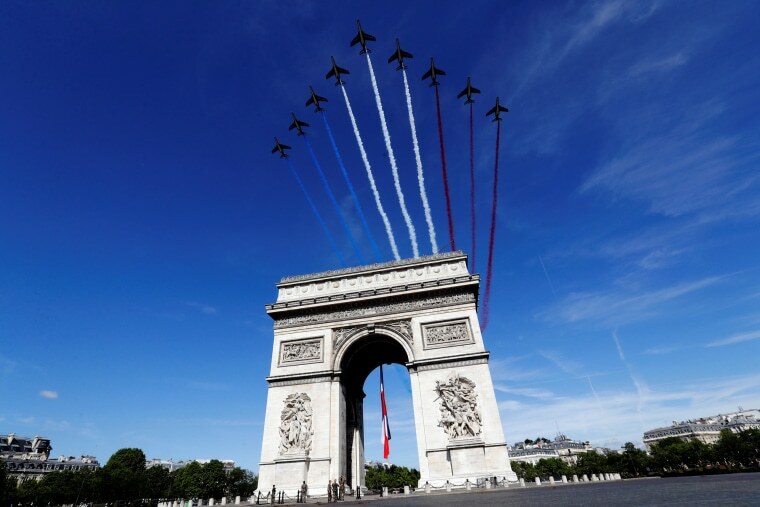 French Air Force jets fly over the Arc de Triomphe. 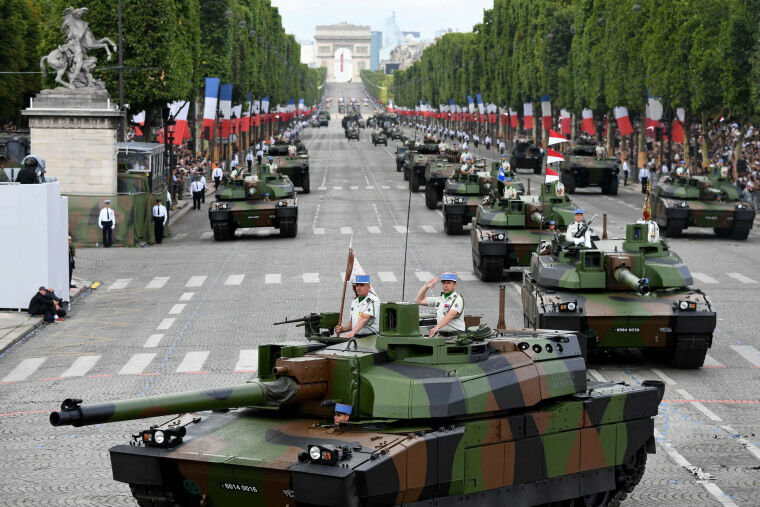 Members of the 5th Dragoon Regiment parade on Leclerc tanks. 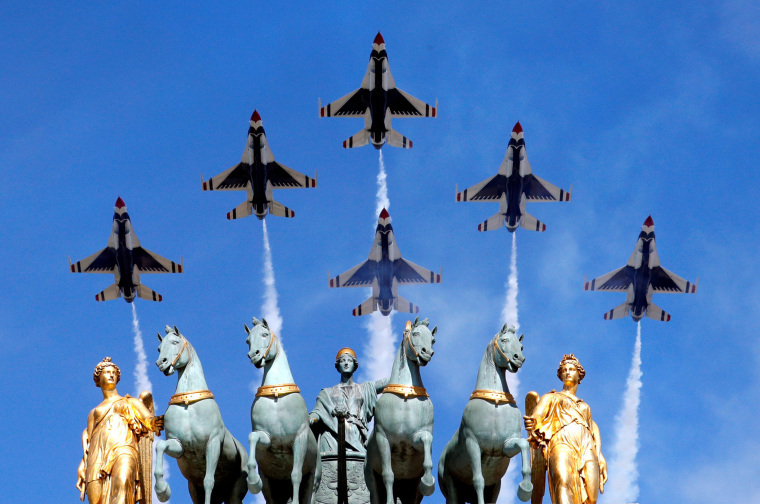 The U.S. Air Force Thunderbirds fly over the Arc de Triomphe. 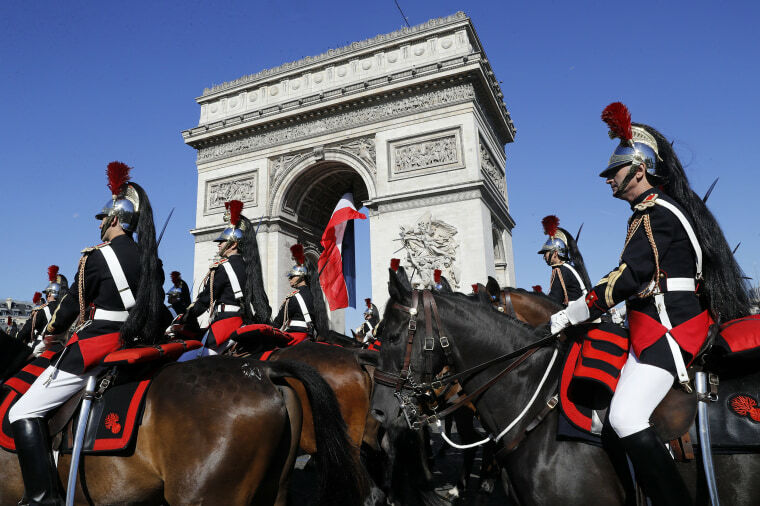 French Republican guards march in front of the Arc de Triomphe. 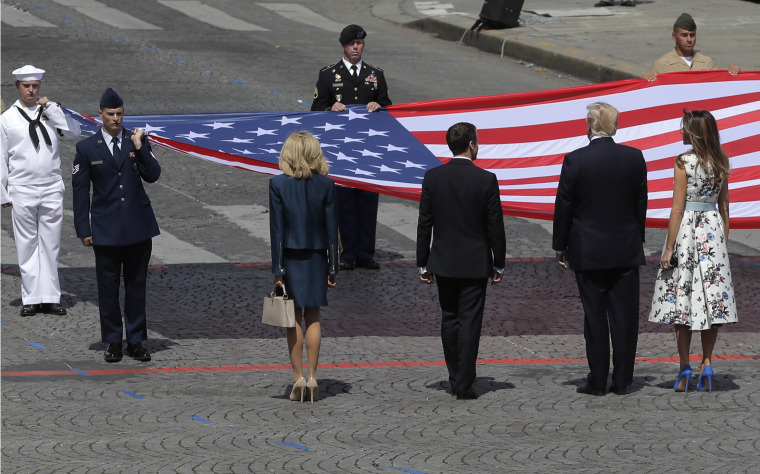 Emmanuel and Brigitte Macron and Donald and Melania Trump stand in front of a huge American flag unfurled by soldiers. 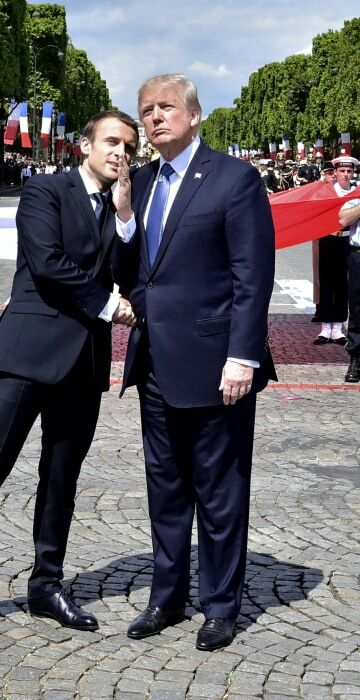 Macron bids farewell to Trump after the parade. 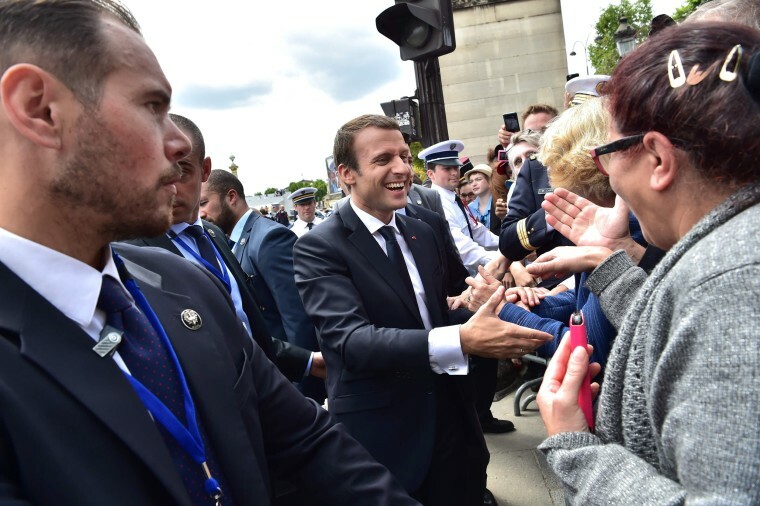 Macron greets crowd of spectators following the parade. 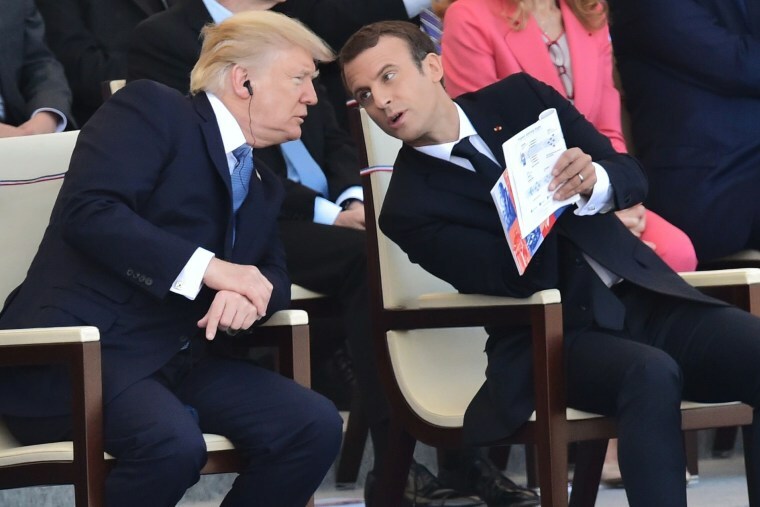 Macron talks with Trump after the parade. 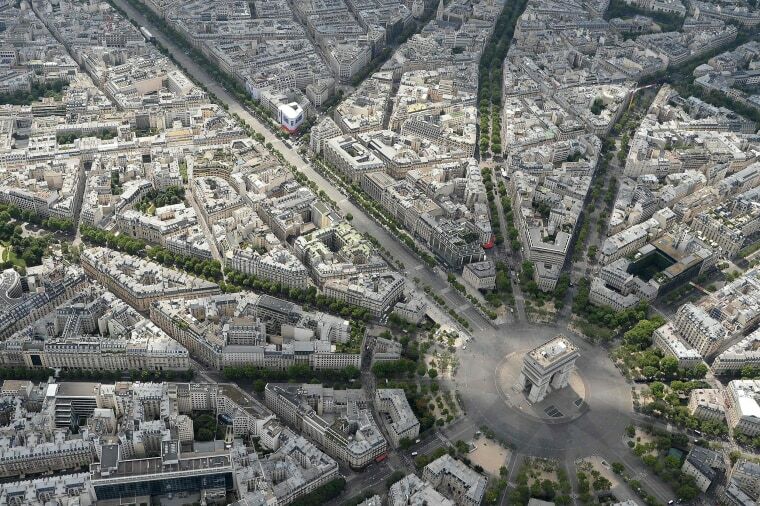 The Arc de Triomphe and the Champs Elysee before the parade.